As DPCC is too busy today to post the scheduled challenge, I will do so instead (yes, we've discussed this). Due to judging delays, the official elimination for Challenge 1 will not be announced until tomorrow. As this challenge will not be extended, it is important to get the details out so you can start working as soon as desired. This schedule is subject to change at any time if necessary. Due to the quit this week, one round (currently undecided) will be a non-elimination round. Now, on with this week's challenge. In this challenge, you are responsible for designing a themed roller coaster. You are welcome to design anything from a tame family coaster to a white knuckle thrill ride, but it cannot simply be an iron ride and must fit properly into your park. You may use any type of coaster and have it supplied by any manufacturer, but it must be a realistic design. If you need assistance on what a realistic roller coaster is or are looking for a creative type of ride, do some research on the Roller Coaster Database. What qualifies as a roller coaster? In order to be considered a roller coaster, your attraction must be gravity powered and run on a track. It may include dark ride sections (such as Revenge of the Mummy), but if the majority of the ride is powered it does not qualify. Gravity powered dark rides (such as the Calico Mine Ride) and water coasters (such as Journey to Atlantis) are also not acceptable for this challenge. What level of theming is required? Your roller coaster does not need to be fully enclosed or have a structure built to house it, but it does need to interact with its surroundings. The Cedar Fair/Six Flags level of theming, where the queue and station are themed but the ride is essentially on an open field, is not satisfactory for this challenge. If you're unsure if the ride is themed sufficiently, ask yourself if the ride experience would be significantly different if it was built in a parking lot. If the answer is no, you need more theming. Note that the level of detail of theming required is inversely proportional to thrill factor, so if you're designing a serious coaster you may want to look at the Busch/SeaWorld parks for inspiration. What is required in your proposal? -The name of your attraction, its location in your park, and a brief description of the attraction's theme. -A description of the queuing area, pre-show (if applicable), and loading/unloading area. -A list of approximate statistics for your ride, including coaster type, manufacturer, track length, ride height, maximum speed, ride duration, and inversion count (if any). -A complete ride-through description. You do not need to mention every single foot of track, but you need to describe all main track and theming elements. -Anything else you feel is necessary to give a complete picture of your attraction. While there is no official length requirements, your proposal should be 2-4 pages. If it is significantly outside of this range, you are probably not including enough detail or are overdoing it. The deadline for this challenge is midnight on Saturday, February 21st. We have discovered that there is a 1 hour discrepancy between site time and PST, so please submit according to site time. Good luck to everyone in this challenge! First of all, what is a "scenic railway"? It is exactly what this challenge is about- a themed roller coaster. This concept has been used in amusement parks to various degrees since the creation of the roller coaster well over one hundred years ago. Many of the early coasters didn't (or couldn't) go very fast due to safety issues or technological restraints (like keeping the cars from flying off the tracks or causing the riders whiplash), so to keep the riders entertained on what could be a fairly tame roller coaster experience the designers started to add elaborate theming and decorations to the rides. Some of these early scenic railways still exist, and are themed to take riders through a mountainside landscape in Europe, around medieval castles or sometimes just randomly between generic "oriental" structures and scenery. Modern coasters now focus so much on speed and extreme elements such as inversions and dives that any theming is unable to be seen much less enjoyed by the riders. Interesting that the best-known themed coaster in history, Space Mountain at the various Disney parks, primarily takes place in near total darkness. Why bother with the theming if it can't be seen? "The Great Pacific Northwest Scenic Railway", more commonly known simply as the "Great Pacific" blends the thrills of modern coaster technology with the visual entertainment of a highly themed environment, keeping to the spirit of Americana:1900's historic American feeling. Constructed by Rocky Mountain Construction, "Great Pacific" is a steel coaster with a steel substructure and wooden structural supports and decorative elements. The design is that of a modified out-and-back coaster utilizing a combination of natural and modified terrain and artificial hills masked with wood, steel and fiberglass elements to appear natural. The total length of the ride is 8,319 ft., making it the longest coaster in the world. There are two chain lift hills (198 ft. and 174 ft.). The maximum speed is 68.4 m.p.h. and the total duration of the ride is 5:47, including load and release time. Four trains of six cars each seat two across in three rows, for thirty six riders per train and an average riders/hr of ~1500. Due to the extreme length of the coaster a fifth train can be added during peak times to increase the riders/hr to ~1875. This can be done safely due to multiple emergency brake sections and redundant collision detection mechanisms. A highly-efficient crew of "lumberjacks" will minimize load and unload times. Lap restraints including seat belts are used, but no shoulder harnesses are needed as there are no inversions on this attraction. The trains are decorated in a style reminiscent of passenger train cars of the late 1800's. The loading station, constructed to look like it was built entirely of massive logs cut from the virgin forests of the Pacific Northwest, can be seen at the far (north) end of The Boardwalk to act as a visual "weenie" and provide access to the extensive amount of land this attraction will require. The queue area features period photos of these magnificent forests and of the logging camps once found in America's Pacific Northwest that provided the lumber for the rapidly growing nation that was America of 1900. Display cases contain artifacts from these camps, tools used by the lumberjacks decorate the walls and hang from the overhead timbers, and a massive cross-section of a tree from that time shows just how large this virgin timber grew. Several informational plaques will provide information about this relatively unknown but important piece of America's past to guests as they examine these historic items while waiting to board their trains. Most of the "Great Pacific" cannot be seen from the rest of the park. Similar to "The Beast" at Kings Island, much of the ride takes place hidden from view due to distance, natural landscape, vegetation and tall trees. The ride "footprint" curves around the north end of the lake that The Boardwalk fronts on and progresses around the far (west) side of the lake. Guests on The Boardwalk can see the first and second lift hills and a few other hills above the trees beyond the lake, but most of the coaster is hidden. The support structures of these hills are masked to appear as mountains beyond the forest on the far side of the lake from the park. All featured animals (bears, etc.) and people (lumberjacks, townspeople, etc.) seen during the ride are a.a. creations, except of course for the occasional bird, rabbit or other wildlife that might be seen enjoying the wilds of the Pacific Northwest. Wherever possible, live trees, plants, bushes, and all other vegetation will be used in the landscaping of the ride. There might be places where artificial trees, logs, etc. are needed due to technical requirements, but they will be carefully detailed to be indistinguishable from the "real thing". The trees, bushes, etc. used will be appropriate for a forest in Washington State. The Great Pacific Northwest Scenic Railway takes guests on a trip through the splendor of the American Pacific Northwest forests of 1890, near the pioneer towns of Aberdeen and Hoquiam, Washington, just a year after Washington was granted statehood. Upon leaving the station the train ascends a lift hill of 198 feet, constructed to appear as though it is built from logs cut from the forests surrounding the ride. As the track reaches the top of the mountain ahead and moves over the crest of the mountain, it begins a downward descent, but not the usual steep plummet expected. The track begins to take a slow, gentle descent down the far side of the mountain- slow at first, to allow riders to enjoy the beautiful landscaping, the dense forest of tall pines that line both side of the track, the rocky outcroppings and cascading waterfalls that empty into rivers that the train crosses on bridges- a true "scenic railway". A Black bear can be seen climbing a tree attempting to get honey from a bee hive while its cubs wait hungrily beneath. Salmon are jumping up a small waterfall, attempting to swim upstream to spawn, and a Grizzly bear is attempting to catch one for dinner. A cougar is spotted sunning itself on a rocky outcropping. But the riders soon notice that "something seems to have gone terribly wrong" - the brakes have failed! The train begins to gain speed, going faster and faster, and soon is plummeting downhill at breakneck speeds, the trees alongside the track now just a blur. Up ahead riders see the track rising to pass over another hill- but there has been a landslide! The track is buried under tons of massive rocks and the train is heading right towards it! At the last moment the train veers to the right, onto a side track away from the landslide but out of control, racing through the hilly terrain of the forest. 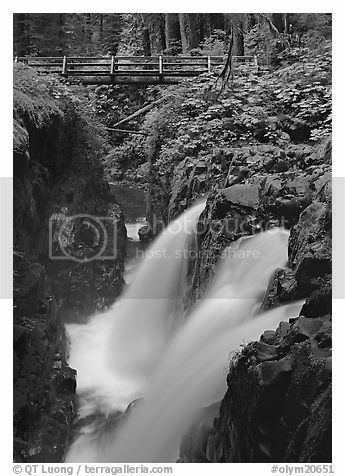 It banks again to the left, then begins a series of twisting and turning curves, often following the terrain of the land but sometimes using bridges to cross deep chasms or rivers of raging water cascading from the mountains. By this time the track has carried the train to the far side of the lake, and after a series of twists, turns and bunny hills the train is finally slowing down. 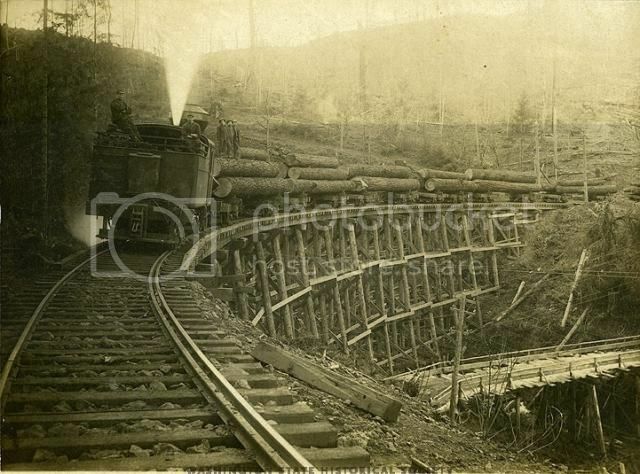 The train passes through a less heavily forested area, an area where lumberjacks have been felling some of the mighty trees to be hauled by teams of oxen down "skid roads" to the lumber mills where the logs will be stripped of bark, cut into boards and eventually shipped to the wood-hungry towns of America. A few steam-powered engines are seen, but mostly this work is still done by hand, by the muscle power of the lumberjacks seen here with their axes and cross-cut saws. 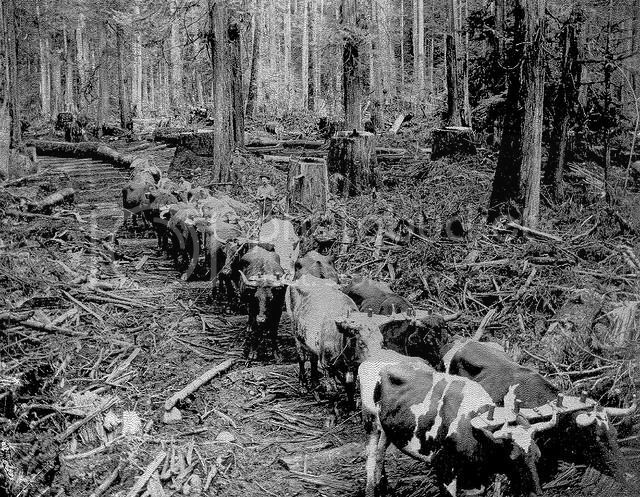 "Great Pacific" railway riders will see the logging process in all stages: some lumberjacks will have just started making the first cuts into a towering pine, others will be sawing the limbs off of the main trunk of an already dropped tree, while still more are hitching a six-foot trunk to a team of oxen, preparing it for the journey to the nearby town and its lumber mill. Suddenly the shout of "TIMBER-R-R!" is heard and a towering pine is seen to be crashing towards the earth- and the train (and its helpless riders)! It crashes to the ground, just missing the track! Another near-miss for the riders of the Great Pacific Northwest Scenic Railway! The track enters a small town, a rough-looking settlement with a few houses, shops, saloons, and of course a lumber yard. But the train doesn't stop- the track curves to the right, making a large U-turn through the town, and the train slowly enters a lumber mill full of steam-powered equipment, giant circular buzz saws and piles of logs being turned into lumber. The smells of coal, grease and sawdust fill the air. The train continues past these noisy, steam-belching machines, exits the mill and begins to climb the second lift-hill, a 174 foot wooden bridge that, like the first lift hill, take the train to the top of a mountain...but there the similarities end. The train crests the mountaintop and the track plunges down the far side of the mountain at a 54 degree angle drop, leading the train on another hair-raising run through the forests of the Pacific Northwest, over wooden trestles and raging rapids, past cascading waterfalls (and actually behind one), and even through an old mining tunnel now used to get the train to the other side of a mountain. 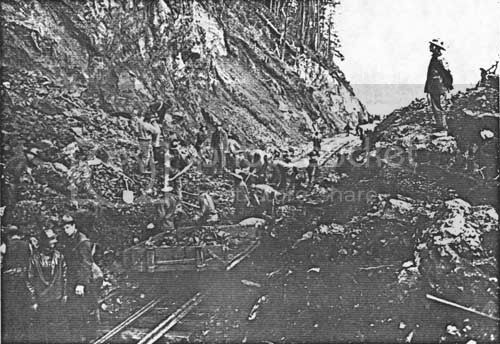 The track carries the train and its riders across the rugged, hilly terrain, sometimes around the hills, sometimes over them, past massive boulders and towering trees, but eventually the train starts to slow down, the track begins to level off a bit, and the familiar sight of the station with its massive bark-covered log columns appears. As the train approaches the station, its track crosses over a bay connected to the lake, a bay where the riders can see part of the lumberjack show being performed in the open-air amphitheater located next to the Great Pacific station. The passengers disembark and head back to The Boardwalk, but not before passing through a beautiful longhouse of the Quinault Tribe of Native Americans, a tribe that still lives in the area of Washington where the "Great Pacific" adventure takes place. Constructed of cedar planks and decorated with totem poles and painted murals of faces and crests of ravens, bears and whales, this structure serves as the gift shop and photo center for the attraction and the lumberjack show next door. "The Great Pacific Northwest Scenic Railway" sets a new world-record for length for any coaster, wooden or steel. The designers have set a new standard for totally-immersive theming, bringing the riders of the "Great Pacific" to the majestic beauty of the Pacific Northwest of 1890 while not forgetting to give them the thrill of a lifetime, an out-of-control race around, over and even through the Olympic Mountains of Washington. In doing so, they have revived the concept of the "scenic railway", a true blending of roller coaster thrills with quality theming. 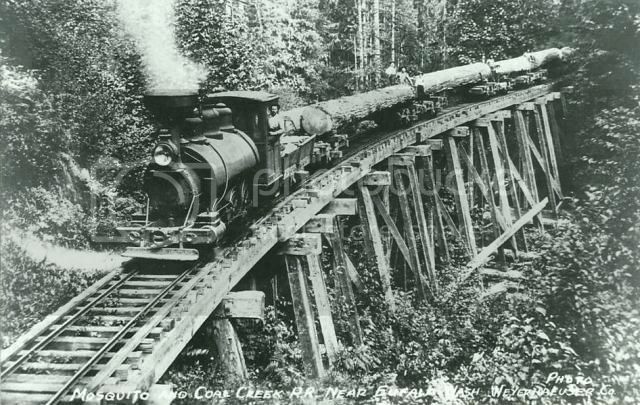 "The Great Pacific Northwest Scenic Railway"- transporting lumber and passengers through the forests of Washington since 1890. First of all, yes, I know the Title picture is cut off on the right side. I can't get it to fit for some reason, but I think you get the idea. You can click on the picture if you want to see the entire photo. This topic was really personal for me- my ancestors were pioneers in the Pacific Northwest in Washington, and go so far back that we have photos taken that are labeled W.T. for Washington Territory. My great-grandfather ran a logging camp in the area discussed in the proposal, and he is buried in Hoquiam, Washington. Although none of our family photos are shown here, we have many that show similar scenes to these. While I couldn't relate personally to "A Trip to the Moon", for me, this challenge was almost like going home. I hope you enjoy your ride on The Great Pacific Northwest Scenic Railway. 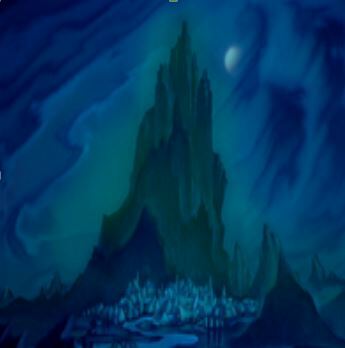 The façade for Escape From Bald Mountain resembles the steep, dark mountain from the classic Fantasia sequence. It is one of the parks iconic skyline “mountains” which Disney has made a staple in almost every park they’ve ever built, rising over 150 feet in the sky, the tallest structure in Realms of Imagination. The pinnacle of Bald Mountain actually contains a gigantic animatronic Chernabog, curled up in his own wings. At night, Chernabog unfolds his wings and makes his presence known to all throughout the park. Red lighting and glowing orange eyes look down on guests as Chernabog observes the world below him. Guests enter the Queue through a small village façade just outside of the base of the mountain. Guests wind through the dilapidated and run down village before entering through a defunct church. Once inside, guests proceed through the church and come out the other side into a dark show room. Guests continue to wind through the village, now enveloped in eternal night. 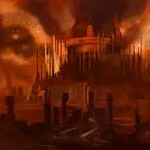 The village is a dotted with large masoleums, cemeteries and destroyed buildings, giving the queue a dark, foreboding, and gothic tone. As they wind their way through the cursed village, guests will catch sights and sounds of spirits, demons, and fell creatures of all sorts as they make mischief throughout the village, as an eerie soundtrack plays softly. Animatronics, projections, and a liberal dose of the Pepper’s Ghost effect enhance these elements, forcing riders to become ever more weary of what lies ahead. 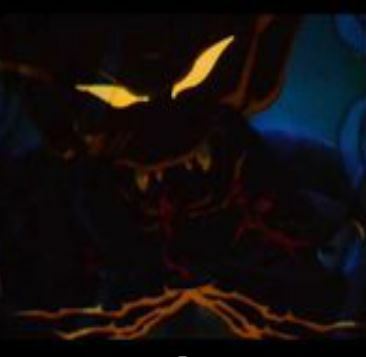 Guests will also encounter some notorious denizens of The Shadowlands such as Scar, Malificient, and Jafar. Guests will hear them discussing Chernabog’s need and desire for innocent souls. They’ll also comment on how they hope his hunger is sated lest he come for them and make dark and twisted jokes. They also mention their disdain for foolish heroes and their attempts to stop Chernabog from feasting on the souls of the innocent. These conversations are random and change throughout the day and at various points throughout the queue and are tied into spirit-stone achievements. Once through the village, guests enter the final queuing portion. They will enter the base of the mountain through a small cave entrance. Once inside, various souls and spirits will cry out to the guests to save them from Chernabog’s grasp. The line snakes through the mountain cave, where below them they can see flame, fire, and lava flickering violently. Guests then ascend the queue as it follows the interior wall of the mountain until they finally reach the loading dock. Escape from Bald Mountain is a wing coaster. Trains are arrayed to the left and right of the track, which is located in the middle of the two trains. Each train seats two riders on either side of the track with eight rows. This brings the total rider capacity for each train to 32 riders per train. The train itself is made to resemble a “Spirit-steed”—ghostly and skeletal horses with an eerie greenish tinge which glows in the dark at night. The vehicles are also equipped with on-board speakers to allow for enhanced sound effects and music. Once aboard their Spirit-Steed, the train leaves the station and makes a sudden, small downward banked left turn before again turning right in an S-turn formation. Riders are plunged further into darkness before the train glides slowly through a miniature version of the same village riders walked through in the queue. High above the town towers Bald Mountain. 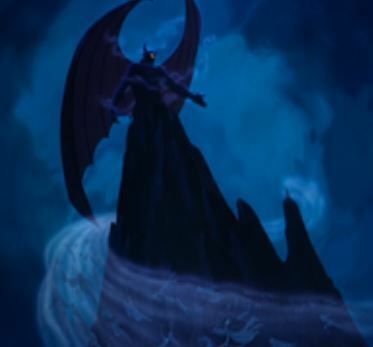 A large projection of Chernabog begins to stir at the top of Bald Mountain as Mussorgsky's classical piece Night on Bald Mountain plays loudly through the on-board speakers. His shadow hands cover over the village and the riders, grasping for them as the train begins to climb the first lift hill. Chernabog's Shadow hands “grab” the train, giving the illusion that Chernabog is “pulling” the train towards him. This is an incredibly steep ascent, with trains ascending at 65 degree angle. Various animatronics and projections of spirits, demons, and goblins of all sorts surround the train as they fly towards Chernabog. The train ascends to the pinnacle of the lift hill--a staggering 115 feet. Once at the pinnacle, Chernabog opens his mouth in a toothy grin as the trains barely escape his hungering maw. The train descends the first major drop, reaching speeds near 60 MPH. The on-board audio shifts to a high-octane “power metal” version of Mussorgsky's piece. The train dives through a misty cavern before popping back out to complete large right corkscrew. And diving again into another large show building. This show building resembles the large craggy canyons surrounding Bald Mountain. Spirits and demons again fly at the riders faces as the train completes a zero-G roll before dipping once again and then completing an upward left double helix. The trains coast along shortly before dipping once again downward and into a bowtie inversion (trains complete a sharp dive loop to the left before doubling back and completing a dive loop to the right) The inversion is a hybrid indoor/outdoor layout—trains complete the loops outside before diving back again into the show building. The train then enters a dark outdoor canyon--the riders coming dangerously close to hitting the canyon walls in a “footchopper” effect as the train completes a series of sharp banked S-turns and small bunny hills. After the bunny hills, the train again enters the base of Bald Mountain. Mussorgsky's piece is reaching its crescendo as riders enter Bald Mountain. Flame, lava, and fire flickers below the riders as demons and spirits dance around the pit. A large animatronic Chernabog unfolds his wings and points towards the train as it begins to ascend a smaller lift hill. Chernabog grabs the train and holds it in front of his face, before the train shakes itself loose and riders plunge backwards through the mountain. (The switch to a backwards coaster is achieved using a similar system utilized Disney's Expedition Everest or Grizzly Gulch coasters located at other Disney Parks throughout the world, where a switch-back track falls is put into place as the train ascends a lift hill). Chernabog hungers for your soul! The train falls backward, completing a large upward right helix spiral and another series of small bunny hills and banked turns. As the riders fall backwards, more spirits fly in their faces. The train enters the final lift hill. This time, riders can see Chernabog's shadow as he appears to be lurking behind them, ready to pounce. Innocent souls are swirling around the train in an eerie and haunting sickly green tornado of souls and spirits. The souls cry out in anguish and agony to the riders. These effects are achieved with the use of Pepper's ghost, animatronics, and high resolution projections onto large scrims. The train then again plunges into the heart of Bald Mountain, this time facing forward once again, as riders dive down 80 feet. Before reaching the bottom of the large drop, a gigantic animatronic Chernabog reaches out for the riders as they pass under him one final time as flames flare up around the trains. Now safely out of the clutches of Chernabog, the train then enters a large inclined loop before entering a large left leaning banked incline section which hugs the mountainside of Bald Mountain. The train then dives under the outside queue/village facade before emerging out of a large masoleum, providing guests in line with visual kinetic excitement. The trains then enter one final steep drop before completing another large banked incline t turn to the left, again hugging the canyon walls of Bald Mountain. The train then enters the final show building, which features many lost souls now following the train in peace, rescued by the brave riders. A dim sunrise can be seen in the distance as the on-ride audio begins to softly play the classical hymn Ave Maria. The trains then enter the unloading station, finally free from the clutches of Chernabog, at least for one more night! Guests will pass through a dimly lit cemetery, where they'll have the opportunity to utilize spirit-stones (themed to various gravestones) to unlock achievements associated with Escape From Bald Mountain before exiting through a gift shop where they will be able to purchase various Chernabog and Fantasia! Inspired merchandise. They will also have a chance to purchase classic on-ride photos. -Listen to all possible conversations between denizens of The Shadowlands (Jafar, Malificient, Ursula, Scar, The Horned King, Pete, Ansem, Xehanort, Cruella De Ville, Big Bad Wolf, Captain Hook, Loki, Hades, etc. )-Unlocks the achievement Eavesdropper as well as the Bald Mountain set piece for use in the Disney Infinity toy box. -Ride Escape from Bald Mountain-Unlocks the achievement Ain't Afraid of No Ghosts as well as the spirit-steed vehicle for use in Disney Infinity. 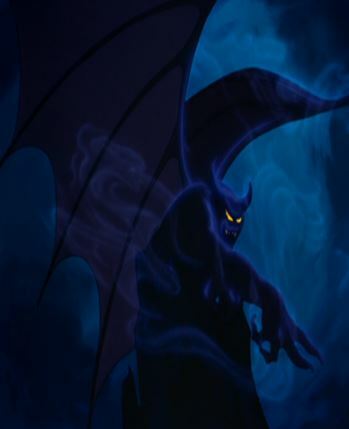 -Ride Escape from Bald Mountain five times or more-Unlocks the achievement Exorcist as well as the exclusive digital character, Chernabog, for play in Disney Infinity. -Complete all possible achievements associated with Escape From Bald Mountain-allows the guest to purchase the park-exclusive Bald Mountain play set for use in Disney Infinity. Thanks for taking the time to read my proposal and good luck to the rest of the contestants! In the load room, a huge Donkey Kong animatronic is seen grunting furiously and gesturing towards the mine kart platform making it readily apparent that the players are going after those bananas. When I say DK is huge, I mean roughly twice the size of the other Kong family members or twice the size of a large man. Intimidatingly powerful might be a better way to word it. On the platform, cast members sporting miner’s coveralls and tasteful red ties help players onto mine karts that look like they belong in the Donkey Kong Country game series, save for the over the shoulder seat restraints. THE LAUNCH! The train takes off, accelerating to 55 mph and climbing the first hill almost instantly. Players hear the iconic Donkey Kong Country theme via headrest speakers. The train begins a barrel roll inversion and, in the near-total darkness, players can see images of DK beating up the beaver army alongside the track. These look like comic book action images with an exaggerated ‘POW’ effect. The moves DK uses in these action scenes mirror somewhat the action of the coaster. The initial barrel roll is accompanied by an image of DK defeating an enemy using a roll attack. A quick, hop hill has DK jumping on an enemy. Next, the tracks do a left/right bend alongside DK using his ground-pound slap attack. The second inversion is a normal loop, alongside DK jumping in a cannon barrel and appearing, through lighting effects, to remain alongside the train. Coming out of this inversion, the train makes a dramatic, banking turn into a descent while DK appears to be barrel launching through a line of beavers, illuminating a ‘POW’ effect every time one is hit. Coming out of the final inversion, players appear to be heading directly toward the giant beaver monster. At the last moment, the wall opens while players hear a ‘BOOM’ sound effect- defeating the final boss themselves! At this point, the trains arrive at the unload platform, above which is a final, huge DK animatronic clapping his hands, grinning wildly, and occasionally giving our players an enthusiastic thumbs up. Players unload into Kong’s recovered banana horde- the area is scented and includes a great photo-op in front of the huge banana pile with the giant, Nintendo sticker banana perched on top. The exit is, of course, through a gift shop themed to the horde where players can purchase stuffed Kongs, stuffed (and scented) bananas, and several banana flavored treats. Among the treats, themed drinks will be served in collectible DK barrel cups and will include banana milkshakes and DK’s Jungle Punch. Hope you enjoyed the ride. Thanks again to the judges and good luck to fellow TPAers. The riders will be separated into the boxes,(Families will be kept together, there will be less boxes, and guests arriving first will be able to exit first.) 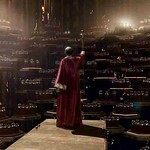 The gallifreyan president stands on the “stage” and says, “Today, we either vanquish the daleks, or they vanquish us. But we have more worries, The Doctor is going to try to use “the moment”, a weapon so powerful it can destroy entire planets with one button. It is up to you to stop him. Find him, capture him, and bring him here, however, as you are not timelords and do that silly little thing you call dying, I have sent out other forces too. Save your own neck first. We have 13 necks to lose before death. Well now, off you go, you have a doctor to catch!” And you exit into the loading bay. The loading/unloading bay will be themed as the battle field shown here. The indoor part of the coaster is visible. Once harnessed in, (overhead harnesses) you launch start from 0 to 70 mph in 3 seconds, and instantly start spinning. You launch into a huge room decorated like the time war battle is happening around you. This is the same room as the loading/unloading bay. After that room, you burst outside, and into Gallifrey, where you enter another s-curve with a raised point in the middle. After, you enter a very large loop, where at the end you plummet down, and raise back up just before you hit the ground. Here, you enter a knot of track, but do not invert. You turn around and slow down before you dive into Arcadia again. The outdoor section will be visible from pathways, and the line, and crosses them overhead and below a few times. This is only the highlights of the ride. In total, the ride should have 4 inversions, be about 3.5 minutes long, have a top speed of 70mph, be about 3400 ft. of track, have no major drops, and have a 56” height requirement. 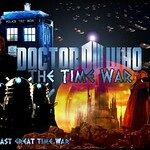 Let's do The Time War again! Good luck to all those who haven't posted theirs yet! You’re not here to fight but rather to flee. You’ve been contracted to… um… “procure” an object by one of Skullport’s seedier denizens (and that’s saying something!). Now that you have it, it’s time to make a quick getaway past a variety of people and creatures who want to stop you for various reasons. To complete your mission, you must take a magical flight where you avoid giants throwing boulders, volleys of arrows, magical blasts, and even a dragon while making your daring escape. This ride is entered from Skullport, specifically through the facade of a disreputable-looking storefront. The first pre-show scene takes place as the queue winds around the shop, with the merchant describing the item - a large gem- he wants the “adventurers” to obtain. The queue then proceeds out the back of the shop and through a tunnel to exit Skullport and come out into the “Wild”. The queue then proceeds into a cave, with the final pre-show element (and loading area) being an open cavern where they can see the gem high up above them. A friendly magician offers to cast a spell of flight on the guests so they can reach their treasure. Steel coaster, inverted style (cars travel under the rail). The ride is partially enclosed, starting inside the cave before exiting out into the open, and ending underground, back in Skullport. The topography of the queue leads to the ride exit and entrance being quite close, but not visible to each other, being in different zones of the park. There is a single lift hill and one inversion. Total track length is approximately 3,500 ft. with a maximum height of about 150 ft. and a ride time of approximately 2:30. As the train climbs the lift hill, the guests pass by the gem and a narrator informs them they’ve retrieved it. Easy? Hardly, as they crest they hill they are immediately set upon by a pair of cave trolls, the track taking an evasive route to avoid their clubs. The car then dives back into the cave depths, the ferocity of the charge scattering a band of animatronic goblins (seemingly) in the path of the train. An opening to the outside is not visible, but the path is blocked by dark elf (Drow) magicians resulting in a series of turns and elevation adjustments to avoid the ensuing pyrotechnics. But the exterior isn’t safe either. A small group of giants happen to be near the cave exit, and they lob boulders as the train zips through a narrow valley, dodging the rocks as well as avoiding (narrowly) crashing into the walls. Coming out of the valley, the train banks back toward Waterdeep to find one last enemy - a dragon! To avoid it’s fire breath, the train performs a loop and dives under the dragon to streak back to the city walls. One last surprise awaits, though, as archers on the walls let fly a volley of arrows. The train jumps the wall and dives down under the city in a corkscrew turn as the arrows narrowly miss. Once safely underground, the ride levels off and the guests arrive at the exit platform. Guests debark and follow an exit passage that leads back to the shop. The merchant expresses (not very convincingly) surprise and dismay at the difficulties you encountered retrieving the gem, and thanks you for bringing it back to him. Guests then exit into his shop, where a variety of wares are on sale. This thrilling technology advanced attraction is based on the the DIsney / PIxar film Walle. Guest embark on a wild 3D ride to save the planet on this exciting roller coaster. A large building looms in the background & a dusty, mini deserted city beacons in the foreground as guest approach the attraction. The "official" outside entryway brings you into BnL (Buy 'n' Large) territory! Guest enter this empty "mini city" & discovered it's comprised of various stores plastered with the B'n'L logo! There are are large billboards above the stores ( listing advertisements for Walle...the waste allocation robot! ) Deserted businesses here include Buy 'N' Large Gas, & Buy 'N' Large Bank &. There are deserted vehicles around "stuffed" with B 'n' L trash. Atop these vehicles are articles about the Earth being too filled with trash to maintain life. This outside line leads directly into the last B'n'L Ultimate Store, where you'll see humorous products that were never sold. This line leads into the Axiom ship. Here guest will find a technology advanced area that sets the stage for the ride.There is a large atrium that boast multiple "electronic billboards" (i.e. HD screens). These screen will display the B'n'L news & activities for the day, as well as details about the ship. Guest will travel deeper within the ship & as you enter into the final part of the queue, an alarm is heard. The Captain comes on screen with urgent ino. Citing an emergency, he alerts the riders that a plant has been discovered & that he needs brave volunteers to assist Walle & Eve in bringing him the plant. At that point, the transmission begins to fade and the voice of Auto is heard, announcing Walle, Eve, & all who assist him are now wanted fugitives. Guest are given 3D glasses (specialized bands prevent glasses from falling off). There are 2 loading zones, one for Eve & one for Walle (both experiences are the same). This attraction contains special 3D effects (in edition to some standard models) to create the futuristic world of the Axiom ship. The coaster cars resemble transportation modules. As the ride begins it's climb, the on air speaker (similar to the type in the movie) reminds riders to keep with up Eve & Walle, they'll be moving fast because they must get the plant to the Holo Detector, so there's no time to lose!! As the coaster reachers the top of the hill, the drop reveals a a neon filled descent below. The coaster sends riders careening down right into the other inhabitants & just when it seems like you'll hit them (their worried expressions also express immediate concern), you'll bank right, gliding into a smooth curve. Walle (or Eve) are seen racing ahead (with the plant) as riders speed ahead. Suddenly there's a drop & the coaster begins "hitting" the various electronic billboards placed all throughout the Axiom. After clearing those, there's a sharp left turn & the vehicle begins to spiral down. As that moment, the coaster shoots forward (A quick launch) & speeds directly into a "wall" & out the other side. It then makes a large "figure 8" motion as it enters into the final stretch home. As AUTO becomes desperate, he attempts to stop the riders by opening an air duct. This final section takes the vehicle through a smoke & laser filled "tube" as it makes it's final curve and glides into a it's finish. The scenes above the riders display Walle & Eve inserting the plant in the holo detector. As guest exit the building, they walk through a (smaller scale) version of the "mini city" that was at the front of the attraction. Only this version isn't as bare & bleak. There are plants & flowers blooming. Sorry guys. I know this is last second, but I decided to drop out because I didn't think my proposal was going to work (it was a mostly unthemed B&M Wing Rider in a Disney park) and I need to focus on my school work. Thanks for allowing me to participate and best of luck to everyone else! Track Length: About 4,000 ft.
Ride Time: About 3:30 min. This roller coaster, which is more intense than Californian Screamin and Rock n’ Roller Coaster, takes place during the big, climatic battle between Scar and Simba and the finish that named Simba King of the Pride Lands. Pride Rock is 194 ft tall and houses the Broadway-style show, Lion King II: Simba’s Pride, and the majority of the queue. Most of the ride is indoors inside a building that is hidden to look like a piece of Pride Rock. Around on the other side of the massive monument is where the entrance of the ride is. This is the entrance to the den where the lions sleep. A sign made of rock states the name of the ride: King of Pride Rock. Guests turn left and follow the path. On their right, there will be cave paintings depicting the story of Simba up to the final battle scene. There will be slabs of rocks telling what the picture represents. One would be saying “Simba is born and the animals come to celebrate his birth” and another would say “Simba befriends Timon and Pumbaa and finds his Hakuna Matata.” As people get closer to the loading dock, Zazu, in audio animatronics form, is sitting in the bone cage Scar puts him in the movie. Zazu says different phrases that would include, “I have just heard Simba has returned.” “Scar will not be happy.” “I hope Nala is okay,” and my personal favorite, “I’ve got a bunch of lovely coconuts, tidily-dee.” He does not interact with the guest, he does not ask questions, play games with them, or anything else Mr. Potato Head would do, but seems to talk to them about what is going on and what might happen. They turn the corner and arrive at the loading station where, like Space Mountain, have two trains loading at a time and the second train would wait for the track to be cleared. The cars look like lions with the head of a lion on the front of the car. There will be onboard speakers so the music can be heard in the train. The lap bars are overhead lap bars and there will be a pouch in front of each seat, with a Velcro lid, to put small things that may fall off during the ride in. As people enter the loading dock, you can hear the amazing score from the battle scene from the movie to build the suspense of what is to come. The train leaves the station to enter a room made of stone. Above the exit way out, a scene from the Lion King is shown. The voices can be heard as you enter the room. Simba states “Stand down Scar.” Scar then responds by saying, “Yes, if you wish your majesty!” As he says “your majesty,” the cars are launched into the roller coaster as flames spew on both sides as you move into the first inversion, a full loop. After the loop, the vehicles encounter many banked turns, sudden drops, and the effects of fire going up when the cars travel on certain track pieces. As you ascend the first hill in a rapid speed, a projection of Scar jumping through fire is pictured as you plummet down the hill and into a quadruple helix. After twist and turns, drops and climbs, and even more fire effects, you see Simba defeat Scar on the wall. As you enter the next room, the music and lighting change tone. This is to reflect that Simba is taking the step to be King of Pride Rock. As the cars start to climb up the tallest uphill climb in any Disney ride, you see on the left side a projection of Mufasa, telling Simba to “remember who you are,” and a projection of Simba is on the right, roaring at the end of what Mufasa was saying. As soon as Simba starts to roar, the car is then launched out of the hole in front of them and enters an inclined loop around Pride Rock. At night, there will be lights that go off when a car is launched out. There would also be a twisted horseshoe, banked turns and surprising drops as the music swells to a climatic finish as an on ride camera goes off. After the final drop, the guests will find themselves in the unloading dock and exit out of the vehicle. Thank you for reading my post. Good luck everyone! I tried to use pictures but they did not show. Sorry about that. So, We’re down to 7 contestants, so this should be relatively short. Also, I would like to congratulate everyone, because this is a particularly hard round. In real life, a good coaster doesn’t really need theming (just ask the folks at Cedar Point), although it is a nice addition. In TPA, we cannot actually ride your coaster, so you have to dely much more heavily on theming rather than the thrill elements. So, without further ado, My critiques! 9(and possibly rigged) carnival games. The Pacific Northwest is definitely one of the last things (right before our weather here in New England! :-) Also, I worry that it would be unclear to riders that the brakes had failed. Not that it really matters, of course. Most people are just interested in a fun roller coaster. But, It’s my job to nit-pick. You have a really high speed coaster here for a “scenic railway”, and I worry that some of your ride elements would go by too quickly. Overall, you have a fantastically fun ride here, that is not only thrilling, but also fantastically themed. Your queue definitely serves the purpose you want it to here. It manages to tell almost the entire backstory of the ride without ever having an actual “pre-show”. However, I do have one major problem with the ride itself. It’s very, VERY similar to “Expedition Everest”. With the exception of the added inversions, from what I read it has the same basic layout. You begin by going up a large hill, the they tell the story of the ride, then you go backwards, some more story stuff happens, you go down the hill, you see the villain (who tries to grab you), the end. I’m sure this wasn’t intentional, but it is there. With the added fact that there was a book once which claimed that the Yeti actually was an imprisoned Chernabog, I could not ignore the similarities. However, the addition of loops was really great. Disney still doesn't have many really high-thrill coasters, and I was glad that you opted for that route. Also, very technical, but I don’t think Disney has ever worked with B&M before. I’m not sure if that’s good or bad, but It’s definitely Interesting. Well, let me begin by saying that I don’t really know Donkey Kong, and certainly not Donkey Kong Country, so it’s very possible that I missed a lot of inside jokes here. Some more pictures would have definitely been appreciated. But, what confuses me is what’s happening around your car. You never said if this was AA of on a screen. Either way, I’m afraid you will be moving too fast to be able to really experience it, and maybe either moving slower or having less happen would have been the way to go here. I feel like this ride doesn’t really live up to expectations, and doesn’t really seem all there. But, I think the story stuff won’t really matter all that much, as long as you’ve created a fun roller coaster. 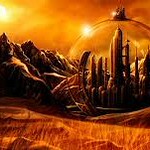 The thing I noticed right off the bat is that your ride is located in your “Gallifrey” area, which was your entrance area, I believe. 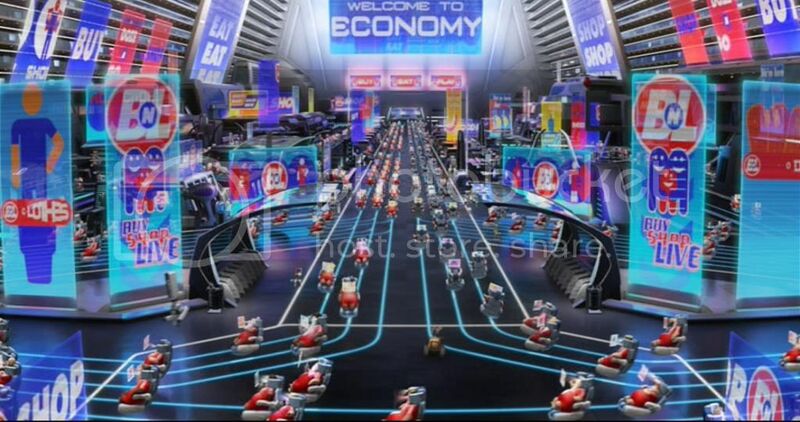 Now, there’s nothing wrong with that, but it was originally described as sort of a “Main Street USA”. Of course, You can feel free to change something as minor as that. You chose to go for the interactive queue this time, which was a good choice. However, i feel your “pre-show” may not have been. Going through a pre show is often a hassle, and one which you are trying to keep so organized is destined to slow down ride time. It seems this could have perhaps been a scene of your ride before the launch, or somehow told through the queue. You used the same image twice, which seems unnecessary, but it doesn’t detract from your proposal. You then give what seems like a walkthrough, but then say it is not the whole ride, which confused me. However, there are 2 major problems. The first is the g forces. A spinning coaster, going through a loop at 70 mph would create incredibly high g-forces. Although not intolerable, they would probably up the ante a bit. Also, there’s no storyline here. Basically, you go in, and the second you do, you’re on your way out. There’s no real moment when “everything goes terribly wrong” or when “the day is saved”. You never even see an audio-animatronic Doctor! However, in the sense of a real world attraction, I think this would work very well. Kevin,you have a great roller coaster on your hands. However, you left a lot to the imagination. You gave almost none of the statistics requested, and failed to give much detailed description of the roller coaster elements. Are your characters AA? If so, you’ve probably put yourself bankrupt. There’s a reason the dragon on top of Gringotts is not an animatronic. Between your dragons and giants, I’m afraid this would be far too expensive for an independent theme park. I understand the necessity for dragons in a park that’s theme has “dragons” right in the name, but it’s important that you find a cost effective way to do that. Other than that, I think you have a good ride, but some more description would be appreciated. Well, I’ll start at the beginning. Your queue, while effectively telling a lot of the story, seems totally disgusting. I don’t know about others, but I do not want to wait for two yours in a fake dump. You have decided to build a relatively slow moving coaster, and I wasn’t sure at first that I understood why. I hoped that perhaps large chunks of story would be told while traveling at these speeds. However, almost all of your story elements are told while the coaster is nearly completely stopped. I understand that you wanted to keep this a family coaster, but I’m not 100% sure it was the right decision for this round. Your Wall-E pun certainly made me chuckle, although I think it would likely be lost on many guests. In my head, this ride is more or less like the 7DMT, with a relatively tame coaster experience, and an incredibly fun dark ride in the middle. Well, I had thought of many possible uses for this scene, but roller coaster is not what struck me. Your queue is very effective, and also something I would be willing to stand in. What do you mean by overhead lap bars? Are you referring to a shoulder harness, or something else I’ve never heard of? Your ride tells your story effectively, and thrillingly. However, my big question for you is: Why are we moving so fast? I mean, anyone in their right mind would simply stay out of the way of such a battle. Now, again, This wouldn’t actually matter on a ride, but for the purposes of Theme Park Apprentice, it does seem to make a big difference. So, there they are, my critiques! Great job to everyone who competed! It was very hard for me to rank these because they were all so fantastic! I’ll be posting the next round shortly! It's time for another round of critiques. I must say that I'm impressed, as this has been the hardest week to grade so far. This season's batch of competitors is outstanding and all of you are coming up with excellent attractions. Scott (The Great Pacific Northwest Scenic Railway): When I heard your title, I was expecting something a little more like a traditional scenic railway, but you've gone for a totally different version of railroad. At first, I was a little disappointed you went with steel instead of wood, but for a railroad a steel track with a wood structure is perfect. Your statistics are mostly good, though your capacity estimate is way high as you'd likely need to use RMC's 2x2 trains (24 riders in a six car train), giving you 800-1000 riders per hour with four train operation. I really like the station and queue of your ride, but I'm not so sure it fits in the boardwalk area. You'd probably be better using a simpler queue more characteristic of the boardwalk amusement parks or locating the ride elsewhere. As for the ride itself, you have created an excellent roller coaster that is thrilling yet not overly intense. You have also done a really good job of integrating the attraction into its surroundings by having the track follow the terrain just like a real railroad. While the slower section in the town interrupts the flow of the ride, it does give riders a break from the action and fits the theme. Although this is an excellent ride, I do have a couple issues. Firstly, the ride is big, and seems too big for your park. A coaster this size is likely a $40 million investment, possibly more once everything is considered, and it would be difficult for a chain park to afford this ride, much less an independent park. My other main issue is that while this is an excellent ride, it really doesn't seem to fit the theme of your park too well. I think a more traditional scenic railway or even a boardwalk woodie would probably work better in your park. This is a very tough one to grade, as I really want to ride it but it just seems out of place. Blake (Escape from Bald Mountain): I've sometimes wondered what an extreme Disney coaster would be like, and I think your proposal has pretty much answered that question. Although I'm not a huge fan of the B&M Wing Coasters, the choice seems appropriate for this attraction as riders will be flying. Your statistics are off a bit, namely the length: X-Flight at Six Flags Great America is a 3000 ft coaster with a 1:15 ride time...given everything you've included, your ride is probably around 4,500 ft long (world's longest wing coaster!). The facade and queue for your attraction are great, and the animatronic Chernabog at night would guarantee a crowd. The first portion of your ride sounds like an excellent coaster, with drops, helixes, and several inversions. You have a lot of interaction with the surroundings, and by projecting images around the riders it will feel as if they are in the Fantasia sequence. However, I'm not a fan of having outdoor sections on the ride, as during the day this will blind riders and ruin the immersion. For a ride that needs to take place at night, keep it indoors. I'm also not a fan of the backwards gimmick on this coaster. While I'm sure B&M could pull off such a thing, they are better known for standard coasters and flying backwards just doesn't make a whole lot of sense. If you want an extended interaction with an animatronic, have the ride stop on a block section or climb a second lift and then continue onward. The ending of your ride is good, but it would probably be better to hide the coaster than keep the flyby...clearly seeing a coaster flying overhead would ruin the magic here. Lastly, good choice on the soundtrack, as it is essential for this attraction. Overall, this is a great coaster that would likely be the world's best wing coaster and Disney's most thrilling attraction ever. Travis (Donkey Kong's Mine Cart Mayhem): I was interested in this attraction when it was teased in your audition, so I'm glad you chose it for this round. I'm not as knowledgeable about the Donkey Kong franchise as the other Nintendo franchises in your park, so I'm going to assume a mine cart chase fits within the series. While I really like your queue, I think it will be confusing to visitors. If you're going on a mine cart, why do you need to climb into a tree house to get there? Perhaps the tree house can be a separate walkthrough attraction and the actual ride queue starts at the cave entrance. As for the coaster itself, you made a smart decision by avoiding a ride similar to Escape from Gringotts, as that is more dark ride than roller coaster and wouldn't do well in the challenge. The dark ride section at the beginning is a nice touch, and I like your idea of having DK launch the riders. I also like the soundtrack for the ride and can picture the coaster's elements lining up with portions of the music (side note: In the future, please post a standard length audio sample instead of an "extended" version that loops the theme). However, while the roller coaster is a good ride, I'm a little confused how it fits the theme. If guests are supposed to be on a mine cart, inversions don't make sense. I like the simplicity of the theming on the coaster, as it would be difficult to follow too much without becoming disoriented on a high speed thrill ride like this. The animatronic DK as riders reach the unload station is another nice touch and adds conclusion to the ride. While your coaster is fairly simplistic, it is a good ride that fits the theme of your park and is reasonably intense without being too much for the average guest. Parker (The Time War): Setting a roller coaster in a warzone works quite well, especially a high intensity ride. I won't mark you off for your incorrect claim, as I doubt you've heard of the ride, but there is a launched spinning coaster with an inversion currently in operation (Veil of Dark at Tokyo Joypolis). I like the interactive queue line, but if guests aren't harmed by fire it might be better to frame it as a training area. I'm a little confused by the way your preshow is set up, and if the picture is meant to be representative of the arrangement of boxes it sounds a bit too elaborate for a short segment (your dialogue description sounds like about a 2 minute preshow). The layout you described for the coaster is a good one, with a nice sequence of elements and indoor and outdoor sections. I also like the dalek encounter, but given how elaborate the preshow is I expected more show elements on the ride. You don't even make one mention of the doctor appearing when the whole point of the preshow was stopping him. Your statistics, unfortunately, don't make a lot of sense. A ride with a 70 MPH launch, 3,400 feet of track and no stops, lifts or dark ride sections is not going to be nearly 3.5 minutes (most likely it will be under 2). You state the ride has 4 inversions, yet only mention 2 in the description, and you also stated there are no major drops yet described what sounds like a vertical twisting dive, a major drop even if it's quite small. You also fail to give a height statistic, which makes me worry a 70 MPH launch may result in extreme g-forces during the ride. Lastly, there is the matter of the spinning cars. While I don't see any reason they wouldn't work from an engineering perspective, I've got a feeling that adding spinning to your intense layout would result in a pretty high number of protein spills and would probably make the ride unpopular with the average visitors. Honestly, you have a good concept, but it was executed poorly and there are just too many potential issues with this coaster. Kevin (Return to Skullport): First of all, your ride name could use some work to make it sound more exciting (use escape, flight, etc. instead of return). Your queue sounds good, though I can't tell if you have actual preshows (where guests stop and view a scene) or just show elements in the queue (where the queue keeps moving and the scene plays on loop). If it's the former, it's unnecessary to have two and the first should definitely be a standard show element, and if it's the latter I've got no complaints. The choice of an inverted coaster is a good one, and all of your statistics sound pretty accurate based on my experience with that coaster type. If guests are supposed to have the gem, they probably shouldn't pass it on the ride. Depending on how big it is, perhaps you could attach it to a zero car (aka the extra set of wheels sometimes present at the front or back of a train) instead. The ride layout is great, and has a lot of interaction with the surroundings. You've gone for a thrilling but not overly intense coaster, which is a great fit for the general public. You didn't mention whether the enemies encountered in the ride are animatronic or static, but given the obstructed view of an inverted coaster it would probably be good to go with mostly static figures (the goblins can be animatronic as you're moving slowly there). Overall, you've got a great standard coaster in a well themed environment and I'm pretty sure this would be a winner in almost any park. Jay (Wall-E: Hyper Speed): Like Up, Wall-E is one of the popular Pixar movies that has yet to get a ride in a Disney park. Your decision to make this more of a family coaster is a good choice given the source material. However, 3D and roller coasters do not mix, and you definitely shouldn't provide riders with loose articles during the ride (even if they're secure, a guest could still choose to remove the glasses mid-ride). I like your design for a facade, but for a space themed area it doesn't fit too well. You can't have guests simply walk right onto the ship, but you need a better way of getting them there (perhaps a B 'n' L teleporter). The section of the queue inside the ship is good. Statistics for your coaster are appropriate for a family coaster and are very similar to Space Mountain's. I'm a little confused by your loading area description. Are there two tracks, or does each version simply have different projections? As for the coaster itself, the first portion sounds very similar to other Disney coasters in terms of intensity. You have some mild to moderate thrill elements, but for the most part it is more focused on interaction with the surroundings. Since you have speakers in the cars, I'm assuming music from the film will be used to create a synchronized soundtrack, another necessity for this type of ride. You've also done a good job with incorporating a mid-ride show scene without interrupting the flow of the coaster, and the remainder of the ride after the launch is a nice conclusion. Although your ride will undoubtedly be compared to Space Mountain, it is different enough that nobody will complain it's just a reskinned clone and fits both your park and the resort as a whole as a slightly more intense family coaster. Brett (King of Pride Rock): You picked a good theme for a thrill coaster, though you probably could have picked a better name. Although the coaster may be a little too fast for its speed, your statistics are pretty good. The queue area is not particularly interesting, but it is sufficient to set up the attraction and, if nothing else, will keep guests out of the sun during possible lengthy waits. Assuming your ride will use full trains (as it is the same system as Rock 'n' Roller Coaster), loading two trains at once is probably unnecessary, and if desired you'd be much better off using a dual station a la Big Thunder Mountain. The pre-launch scene could use a little more set-up, but it is a good introduction to the ride. The first part of the ride is pretty good, with a nice sequence of elements. Showing Scar's defeated mid-ride doesn't work so well, as that should be the conclusion of the attraction. Having the ride launch again just feels unnecessary. A better idea would have been to have Simba nearly defeated and then, encouraged by Mufasa, he attacks Scar again as the second launch occurs, then the defeat happens at the brake run. Nevertheless, the second part of your coaster is just as good as the first, you just need to make sure it is disguised at all points and never appears to be just a roller coaster. In summary, this is a great thrill ride that is more intense than anything Disney's done to date, though not too intense for a Disney park. Scot E - The Great Pacific Northwest Scenic Railway. As someone who’s coaster credits include The Scenic Railway at Luna Park Melbourne… You had me with just those two words, but you gave me something different to what I was expecting. 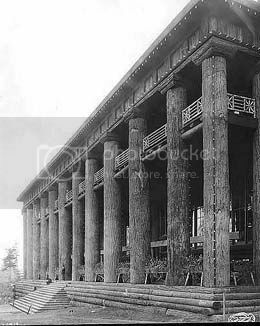 I like the idea of combining the classical railway station/temple look with the logs of the Northwest, it seemed odd to me at first, but it just works. The Life-like animal theming seems brilliant, as is your decision to split into a slow/fast sections. I was wondering how you’d deliver the “extreme” experience, and the broken brakes, whilst a heavily used trope, remains a classic that fits the ride to a T.
The only possible issue I have with the ride is a very minor nitpick, and thats one about managing expectations. Most of your ride is out of sight - so it should be - but a guest who hasn’t looked at the map may be fooled by the “Scenic Railway” title into thinking its a tame scenic experience. A minor quibble that can be fixed with proper positioning at the station (well I had to find a nit to nitpck somewhere). Disney parks’ Coasters arent known for their positions in the biggest/fastest/strongest league, but the few that they do have are known for an amazing themed experience, and being a ride the whole family can enjoy together. This to me makes the choice of an inverting Wing coaster interesting… Not saying they’d never do such a thing, but it does seem to be out of character… Having the whole family ride together was one of the things that really drove the Disneyland vision after all, and you’re excluding the older and younger guest by H&S necessity. Putting that to one side, the ride itself is a good one, well thought out with the theming (being on a “Disney” level for sure. I’m sure Teenagers and young adults would queue up again and again to ride over and over again. Travis, before you post another entry, make sure you’re familiar with HTML formatting (bold, blank lines, etc)…. your entry has come across as a wall of text, and that makes it hard to read. I do really like your ride. The queue area is very well detailed with great features that should keep waiting riders entertained. Travis (and this advice goes for everyone else), try to remain “ in character when writing your proposal- You’re pitching this to a group of Executives in a Boardroom, not having a conversation about rides. If you want to have a general chatter, use the chatter thread… Keep your proposal to the point - no “pauses” or “Side notes” (unless the side note is in character. Given in the last TPA I proposed a Doctor Who roller coaster, I was interested to see what your take would be on it. For those that missed it, I proposed a Spinning Wild Mouse coaster, synced to the Doctor Who theme, with the ride itself themed as escape pods from the Tardis. I’m not going to mark you down for this, but I know that when it comes to the Time War, the BBC are a bit protective about licensors using it - the Big Finish Audio dramas aren’t allowed to even hint at it… But I see again you’re trying to put us in an actual episode, so it all balances out. I’d have either gone for something like a Wing Coaster or inverted if you wanted the inversions and other manoeuvres, or tone the other G-Forces down. The theming is good, and does a very good job of putting you into the episode, getting the look and feel right. But the ride needs work to be viable. Your entry seems very short. You’ve got a lot of great themed elements included… but there just doesn’t seem enough when compared to the other entires. I’m not sure about the Gem thing… It kinda seems “Cheap” to just go past it like that and declare it collected…. I think you should have looked for some other “effect” to achieve this. The Escape though, what you’ve detailed of it, does seem like an aamzing show with the drow. Next time, I’d like to see more detail from you. Firstly, and in contrast to Bald Mountain, your coaster seems a lot more Disney (its a ride the whole family can enjoy together), so full marks for understanding the brand. Its nice contrast to see a coaster that isn’t trying to be the biggest/fastest/strongest. In fact, given the emphasis on theming in the spec, a “Slower”, tamer coaster is perhaps a better choice as it gives the rider more of an opportunity to appreciate it. I like the chasing aspect of it… In your design you’ve managed to design a coaster that manages to be “thrilling” without the tricks that most coasters default to. The Narrow escape at the wall is also a fun choice. You’ve also added a consequence of the Ride - from the “bleak” entry to seeing flowers on the outside. An amazing masterstroke. I do like your theming, and your projections are a really good idea.. but I would have liked a little more detail on the layout. Just a note, there really was nothing between the top two - they were both amazing. I’m edging it slightly for Hyperspeed based on the “consequence” of the ride being shown at the end. Yikes! Another tough week! This is getting harder and harder! Well done to everybody! I will keep it short because I really do not have anything critical to say! Great Pacific ( Scott E): I really liked what you did with this setup! I know I wasn’t the biggest fan at the beginning of your park idea, but I have really turned around on your attractions! I really liked this setup and it fits very well! Escape from Bald Mountain (Blake): This was a really good idea! So good that I did this attraction in the first TPA on the website ? Now, don’t worry, I am not accusing you of stealing my idea since I just mentioned it in a larger park and yours was much better than what I came up with. I guess great minds think alike! Donkey Kong (Travis): As I expected, this was another great attraction for your Nintendo Park! I could see this being a fantastic attraction! Time War (Parker): It is another great Dr. Who ride, but I am such a non Dr. Who fan that I don’t think that I would catch or get most of the storyline to this roller coaster. I would ride it for a roller coaster sake! Wall E (Jay): I thought this was a clever way to get Wall E into the park and I would have never thought of a Roller Coaster! Very good! King of Pride Rock (Brett): I liked the gamble of going with the Lion King as a roller coaster since there are so many Lion King attractions! While I think this was a clever roller coaster, I would have preferred to see the Wilderbeast scene as the coaster! I apologize for the delay. Due to unforeseen circumstances, Alan has withdrawn as a judge, hopefully to return again later in the competition. But for now, we will have to go on with 4 judges. So, it's time to tell you who has been eliminated. Parker, you have been voted off the island. I personally liked your concept of your park, but, you didn't give us enough description on your proposals. It is for these reasons that you have been eliminated. Good luck to the remaining contestants!